Who am I this time? – Escape Reality, Read Fiction! The above is the title of a surprisingly sweet made-for-TV movie starring Christopher Walken and Susan Sarandon from before Walken was firmly entrenched as the weird crazy evil guy. It was a long time ago. The movie is a romantic comedy, and the two characters are rather shy and nerdy in different ways. They both get talked into joining a small community theatre group, and turn out to be great actors. They lose their extreme shyness only when playing their parts. As long as they have other people’s lines to say, they’re fine. Unscripted, they’re lost. They can only express their growing love for each other, by acting. They end up spending their lives together, living theatrically. If you can find a copy, it’s worth an evening’s popcorn. 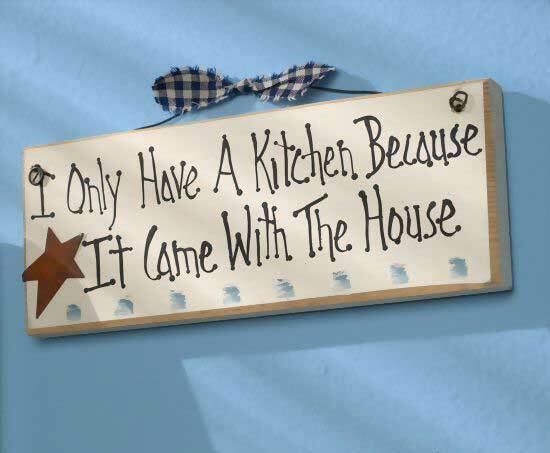 I have a sign in the kitchen that I bought when we moved here, that reads, “I only have a kitchen because it came with the house.” I used to say that I cooked in my last life. Or that the microwave cooked, I didn’t. After coming home at 6, or 7, or occasionally later, cooking simply wasn’t worth bothering with. But in the last couple of months, while we’ve been here packing up, the priorities have shifted. My old recipes have come in handy again, and we found some new ones. 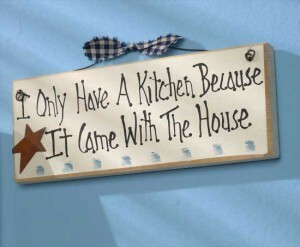 There’s nothing fancy involved, but yes, I do cook in this life, and no one has died. I may need a new sign. I wonder if there’s a source for “Dinner will be ready when the smoke alarm goes off”, since that’s already happened a couple of times. But some parts of my previous lives are not coming back, and going through the books and boxes is making that abundantly clear. I’ve moved my needlework patterns and books and supplies from Chicago to Anchorage to Tally to Chicago to Gainesville, and I have shoved them into deeper and deeper closets each time. It’s a hobby I enjoyed when I did it, but it’s time to acknowledge that I’m not going to pick it back up in the reasonably foreseeable future. Or even the unreasonably foreseeable future. I used to do cross-stitch when I watched television, and, considering that vast wasteland, I don’t do that either. Social networking, video games and the internet in general have taken over that time. But letting all that go and giving it to a friend who will use it, that’s difficult. Even harder, I have a truly big collection of Star Trek books. I think I have all the mass market paperbacks, trade paperbacks and hardcovers up until last year. That’s the point where I finally realized I was never going to catch up to reading all the ones I had, let alone any new ones published. I have all the episodes of all the series on DVD, and all the movies. I’ve seen every movie on the first night, even the bad ones. But the books are dead weight at this point. 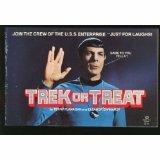 I have a few collectibles mixed in there, including a copy of Trek or Treat, which still grabs the funny bone even decades later. The really good stuff like that will be hung on to. I still love the Trek universe, and I wish the rights-holders would do something good with it again. Getting rid of entire swaths of stuff feels like losing parts of my identity. It’s hard to separate what we own from who we are, which sounds stupid when written, but is very different in actual practice. I’ve always believed I’d go back to cross-stitching someday, but if that day hasn’t come in 10 years, realistically, it’s not likely, and it’s time to move on. I know someone who will get more good out of what I’ve been carrying around than I have, no matter what postage to her is going to cost. I watched the last season of the initial run of Star Trek with my dad. He passed away 20 years ago this coming October. Star Trek was the first science fiction I ever got interested in, and without that first taste, my life would have gone down a very different leg of the trousers of time, to mix in a Discworld metaphor. But I have to keep telling myself that all the mass market paperbacks are available as ebooks if I really want to read them. Sometimes, it’s not the thing, it’s the memories attached that make all the difference. Are eTBRs easier to forget? Help me, I’m a biblioholic!